AMAZING SCARVES AND WOVEN BASKETS DESIGN SEE PICS. 100% QUALITY SILK. PARISIAN DESIGNER CHIC. MINI LENGTH. This is an amazing 100% leather skirt. Perfect for this season. In excellent condition! Size 10 / 28" waist / 24" length. Jaeger Women's skirt - size 10 Condition is Used. Dispatched with Royal Mail 1st Class. Gorgeous checked wool blend skirt, made in England by Noto. Not sure of the age but would guess 70's - 80's. Fully lined in satin, it can be hand washed. Flat across waist approx 40 cm, l ength approx 68 cm. Womens Jaeger Classic Chic Camel Vintage Pencil Skirt Size 10. Condition is Used. Dispatched with Royal Mail 2nd Class. Size in label UK 12, modern size 8/10. Beautiful true vintage, 100% wool midi tartan pencil skirt from Nordstrom. Purple, green, blue, red, and navy check with a dark purple lining. Hidden zip and button back fastening, vented at the back. It sits high on the waist, has deep functional pockets and is super flattering with shirts or jumpers tucked in, and looks great with heels for work. Perfect vintage condition, no visible faults. Worn a handful of times, vintage size 4 but probably more like a 6 or small 8 according to current sizings. Laura Ashley long crepe skirt, very dark brown, beaded at the front, lined, back zip, back kick split. Size in label UK 14 EUR 40 US 10. Vintage Ladies Linen Suit.Contrast Trim and Belt. Pleated Skirt, Size 8/10. 100% linen 2 piece suit in orange with contrast black piping and belt. Detachable black/white collar. The jacket has a fly front fastening, piped round neck and breast and hip pockets and is unlined. Length: 84cm/33". Labelled Size 36. I would estimate this to be a size 8-10, depending on fit. New Without Tags mint Green Pleated Skirt. Size 10/Small. A classic black Joseph pencil skirt from 1980s the fabric is like a smooth satin back crepe. A beautiful vintage Aquascutum skirt bought in a Vintage shop in Brick Lane for £40 I LOVE THIS but it’s just too small for me :-( I’m a UK 8 and it’s too tight for me so this is definitely for a size UK 6 Waist I am 5’3” tall and this comes just below my knees Such a lovely skirt in a beautiful wool blend, dog tooth print fabric Stunning pale pink/ivory colours The back features a slit which is just amazing when on So gutted to be selling this but I have no use for it now it doesn’t fit! UK only * Postage is £4 because it is a heavy item! * Serious buyers only please I have had a lot of interest OOS so first come first serve :-) thanks for stopping by! Pure Wool Coffee Coloured Tweed Check Pleated Skirt. Material Is Pure New Wool. Size Is 16. Shades of Pink and Cream. Size 10 A-Line Skirt by NEXT. Size in label UK 18. Size in label UK 16 EUR 42. Good condition. Wide flare pleats at the hem for a flattering look especially with long boots. Wool blend skirt. Button and zip closure on the side. FULL LENGTH WITH VERY FULL FLARED HEM. A-LINE, FULLY LINED, PURE NEW WOOL. Vintage houndsstooth EASTEX pencil skirt. Never worn!!! Still has extra button on a tag. 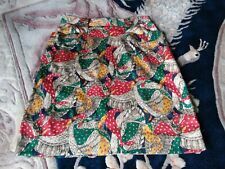 Absolutely beautiful skirt made from 55% Wool & 45% Polyester Length (waist to hem) 26inches Width (hips) 20inches Vintage sizing so would say its more like a 12. Excellent condition. From a smoke free home.